Green salads served alongside dinner (especially during the week when it’s just the 7 of us staring at each other) are usually a throw-together affair for me. For heaven’s sake, no recipe and usually served with dressing straight from the refrigerator. In my case, it’s always and forever bleu cheese (my fave is by Litehouse), but my kids and Brian are straight ranch guzzlers (homemade ranch when I’m on my A-game and Litehouse brand when I’m not – and PS, no affiliation with them, just love, love their dressings). Anyway, what I’m saying, that is probably not at all clear at this point, is actually that I love to have a few, what I would consider, more “gourmet” salad offerings for when we do have company over. I have this delicious green salad (so yum, don’t even think about leaving out the pears) and a couple incredibly tasty spinach salads – and I serve them often when it’s not 5:30 p.m. on an average soccer-practicing Tuesday night when we’ll be lucky to eat something more than just the main dish at the real, live table instead of standing around the kitchen island. I’m thrilled to add another delectable salad to the nice dinner rotation: Sundays or we’re having guests. My friend, Allie (who I met through blogging, but not really met if you know what I mean) sent me this recipe years ago. I lost it. And she thankfully sent it again. Of course, I adapted it like crazy based on my taste preference and to cut down the oil a bit but the end result is magic in Caesar salad form. I can’t necessarily declare the dressing an authentic, classic recipe since it doesn’t contain raw eggs or anchovies, but it is still tangy and flavorful and delicious. And as a sidenote, we all know that a true Caesar salad is more than the dressing, right? It’s about the crisp romaine lettuce, shaved or shredded fresh Parmesan, and of course the croutons (please tell me you’ll try homemade croutons at least once because the utter fabulousness will change lives, I’m sure of it). 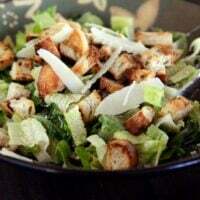 I’m in the Caesar salad just for the homemade croutons, if you want to know the truth. But this dressing certainly doesn’t hurt. Make this midweek (you crazy kid, you) or wait until you have a special occasion; either way, it’s really simple and really, really delicious. Oh, and if you want to take it completely over the top and make it a main meal, serve it with this Lemon and Garlic Grilled Chicken. Heaven. For the dressing, combine all the dressing ingredients together and whisk vigorously, shake together in a jar, or blend until well-combined. 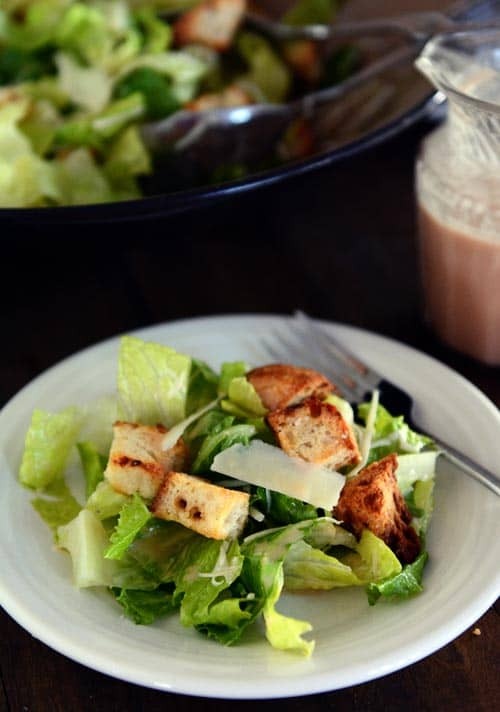 Toss the romaine lettuce and Parmesan cheese with the dressing. Top with the croutons and serve immediately. Sometimes I like to add a dollop of mayonnaise or thick, plain Greek yogurt (about 2 tablespoons) to the dressing before blending to give it a creamy texture. And sometimes I don't. Either way is delicious. I loved this recipe! Better than my previous favourite that I’ve been unable to top for years. Very tangy and garlicky! Salad tastes great will have to make it again. This is my favorite homemade salad. Great dressing that is easy to make. Another easy to make and delicious. Don’t make them too long before you eat as there will not be any left, as Mel hinted. I am a 65 year old male who loves to cook and never have gone wrong with any of Mel’s recipes. Frank M. …. classic know-it-all, stiff-necked control freak. Try taking your blinders off and relaxing that sphincter. One of the greatest things about creating and cooking food from scratch is modifying, experimenting and building to ones’ liking/taste. There are no hard and fast rules, unless of course you’re preparing food for a chain restaurant, or selling your product to the public, neither of which apply here. Do us all a favor and keep your insincere compliments to yourself, and let the rest of us enjoy Mel’s wonderful recipes in peace! Classic recipe and was a wonderful side dish. I liked the slight bite the dressing had. I always read comments through to the end. In reference to Frank’s comments this is a cooking blog for people looking for new things to make. Thank goodness for Mel sharing all of her secrets and cooking tips with all of us. It’s such a shame when someone has too much time on their hands and have to criticize others. As a fellow Canadian I am sure that we have much better manners than that, and my Mother always told me if you don’t have anything nice to say then don’t say anything at all. Thank you Melanie we all appreciate the hard work you do for us all every day . Whatever you want to call this Caesar salad dressing is fine with me, but just remember to call it wonderful! I cook a lot and have made this dressing many times and it always tastes terrific. Thanks so much! As someone who is very allergic to anchovies I really appreciate this recipe. It’s nice to have an option. Thanks! Sorry I just saw the post saying it keeps a week or two – thank you!! I halved the oil and vinegar and kept everything else the same and made the croutons from the parker house rolls I had in the freezer and it is DELISH! I fried some bacon and crumbled to add that in as well – DOUBLE DELISH!! Thank you for the awesome recipes! Hi Mel! Does the dressing keep in the fridge for a few days? I have more than I need and would like to keep it in fridge – just hoping it keeps well. Thanks! How long does the dressing stay fresh? How long would the dressing “keep” in the fridge? Probably a week or two. Sorry, I had not seen this before I posted the same question. Shellie – yep, that’s why sometimes I use Greek yogurt instead of mayo (if making this for people that are egg-free). hi mel.your blog is my only ‘go to’ esp for cakes & bread recipes.thanx. im waiting for your CHOCOLATE TRUFLE CAKE recipe eagerly…………. Mel, classified as “authentic” or not, your recipes are still authentic to me! They are made by a fun-loving, hard-working, willing-to-share-with-the-world woman, and that is authentic enough!!! You have changed my life and the lives of many others by being willing to share your efforts and talents with us, and I will never be able to thank you enough!! God bless! (And, to be honest, I avoid Ceasar salad because or the anchovies…. I was grateful to find a variation without them! 😉 Thanks again! This is getting embarrassing! I’ve been following your blog for three years, and during that time, MANY people have asked for “my recipe” after a taste! 90% of the time, they get referred to your blog. I swear I do follow other blogs, but your recipes have never ever let me down! Also, I adore Caesar dressing, but I rarely have anchovy paste and pasteurized eggs just lying around the fridge! I tried this and it is so delicious!! I seriously can’t tell the difference between it and the “authentic” stuff! Keep the awesome recipes coming!! I just made this salad to go with dinner. I gave the kids ranch, and my husband and I had this dressing. I didn’t think it tasted very much like Caesar, but it was good! It was a bit tangy and slightly spicy (which is why I didn’t give it to the kids). Next time I might just decrease the dijon a little. Thanks for the recipe! I have never had a Caesar salad due to the raw egg and the anchovies. I just can’t. I’m so glad you posted this recipe!! I’m going to try it this week with homemade croutons. Looks delicious – I love anchovies so I would definitely add more to the top! Wow I feel famous! I am so glad you love it Mel! It’s been in our family for years, my grandma still uses egg and anchovies, my mom still uses the anchovies with no egg, and I make it like it is posted on here. So Frank, it is indeed, a Caesar recipe. And you, my friend, should sleep great tonight knowing you are the sole negative commenter on this here food site! Everyone loves Mel and everyone trusts her recipes and taste implicitly. If you ever ate at the restaurant this gourmet dressing was adapted from you would know that you, Frank, are not the only foodie around here. Sorry to burst your bubble. Love you Mel! You go on calling food whatever you want. You make us all look good when we cook your delicious and appropriately named recipes! Hugs! I am a Caesar salad lover, and I have a tried and true recipe that includes an egg yolk and anchovies. The anchovies don’t taste “fishy”, but instead add a salty complexity to the dressing that you won’t get from salt alone. That said, I have seen many recipes that substitute mayo for the egg yolk and omit the anchovies. This dressing sounds delicious, and it reminds me of my favorite lemon vinaigrette recipe (with the addition of the Worcestershire, hot sauce and mayo)! Mel- I love Litehouse salad dressings, too!Have you ever tried their new OPA Greek yogurt salad dressings? I love the bleu cheese, ranch and creamy Caesar! Homemade is always best, but these are really good salad dressings! Hi Kim – I agree that anchovies lend a great depth of flavor to other Caesar dressings – I bet yours is delicious! It’s a wonderful thing that there are so many varying recipes out there otherwise food would be awfully boring, don’t you think? I haven’t tried the Litehouse Greek yogurt dressings yet but now I’m going to have to after your rave recommendation – thanks! Mel- I totally agree with you that switching up and changing recipes and ingredients makes cooking fun and keeps it interesting! I’m surprised at the controversy over this recipe. I am planning to make this recipe for dinner this week (topping it with grilled chicken) and I have no doubt that it will be amazing! Thanks Mel! I, too, have been looking for an egg and anchovy-free, homemade Caesar dressing recipe. I can’t wait to try this! Have printed out this egg/anchovy free Cesar salad dressing, and can’t wait to try it!!!!!!!!! First off: I love your blog, have copied and pasted a lot of your unique recipes unto my Appetizer, Mains, etc. flash drives. However, having complimented your unique expertise, I must complain about the “title” of this recipe. Although you acknowledged that you were not going to use anchovies nor coddled egg, it is terribly incorrect to refer to your recipe as a “Caesar Salad”! It is not even close without those two key ingredients, and anyone ordering same recipe at a Restaurant, is not having a Caesar Salad, and wouldn’t know any better. It should be called a romaine salad. Hi Frank – thanks for weighing in on this but I’m afraid we’ll have to agree to disagree. Food can be interpreted so many ways and I see “Caesar salad” as the combination of romaine lettuce, croutons, Parmesan cheese with a Caesar-like dressing – basically the sum of its parts (otherwise, you could throw authentic Caesar dressing on spinach and arugula leaves and call it a Caesar salad which would be a travesty). Just like chocolate chip cookies that have been modified to be egg-free (I have a recipe for those actually and they are as delicious as an authentic chocolate chip cookie), a Caesar salad can still be a Caesar salad with a dressing modified to be egg- and anchovy-free. I have nothing against a restaurant-style Caesar salad (my favorite is from the Cheesecake Factory!) but thank goodness food is allowed to evolve and change, otherwise all my egg- and fish-free friends would never be able to have a Caesar salad! No, you could not throw authentic Caesar Salad dressing on spinach or any other salad green. The classic recipe is with Romaine lettuce, nothing else! Wow! I can’t believe your reply? For your non-egg/anchovie consumers, just tell them outright, that they cannot have Caesar Salad, period! Google “Caesar Salad” and you hopefully will understand my concern. It is not to be tampered with, it is a classic! Like Shakespeare, Bach, etc. LOL. I’m going to have to agree with Mel on this one. From my understanding, the egg is used as an emulsifier, and not for the taste. Some people do not like to eat raw egg, so using mayo is a great substitute. As for the anchovies, they are primarily there for salt and savory flavor, but she subs with other salty and savory ingredients such as Worcestershire sauce, which in fact has anchovies in it. I have seen MANY Caesar recipes with no anchovies, and they were still called “Caesar.” Finally, it’s her blog so she can call her recipes whatever she wants to. As an AMERICAN, you don’t get to rename a classic “American” recipe! And Worcester Sauce does not have anchovies in it! This thread is too naïve to comment on any further! But, still a good blog, just needing some more discerning foodies. When I think of all of the variations of Lasagna, hamburgers, enchiladas, tacos, etc there are I am grateful we can enjoy our food in many different ways. One of my favorite Mexican restaurants serves a Hawaiian quesadilla! The best thing about food is there are no rules! Well, other than raw chicken. I hope to someday visit your amazing restaurant with your amazing “authentic” Caesar salad. For a “foodie” I find it ironic that you have a set rule on how something should be made. Someone who has a true love for food, appreciates it in all the different ways it can be prepared. Also, speaking as a fan of Mel’s Kitchen, it’s her blog. She obviously has quite a following and for good reason. the kitchen bible: “Joy of Cooking” either version. If you do not have it, you are barely qualified to even comment on the subject at hand. This is not a male versus female issue, not a love in, but a quest for some great recipes! I have never complained on this blog before. Hang in there! Cool, Frank! Keep your foodie spirits going! I will keep your husband/wife/friends/dog and cat in my prayers. I’m sure they will need it. Frank, you sound like loads of fun to be around. 1) ‘Ignorance’. Not “ignores”. Your failure to proofread makes you sound, well, ignorant. 2) Worcestershire Sauce, which was first mixed in 1838, contains anchovy as an ingredient. 3) AMERICANS as Americans, do indeed have the 1st Amendment right to rename an American classic, such as the Caesar salad, which, wonderfully enough, was created by an Italian immigrant. Because AMERICANS are diverse, innovative, and creative like that. And it’s a right particular to, well, AMERICANS. Please don’t reply, blasting others for their lack of qualifications or for exceeding the “bounds of rational discussion” (I assume you meant ‘boundaries’, rather than ‘leaping strides’? ), before bothering to at least write a coherent and grammatically correct post worthy of a second-grader’s skills set. This is hilarious. 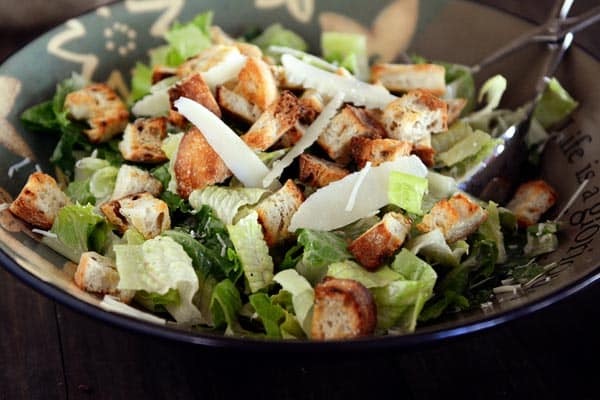 I was googling “caesar salad without anchovies” and came across this recipe – bc I do not want to include those little suckers in my recipe! Also, I have been pleasantly surprised several times while dining out and ordering a caesar and it comes out with a “light” dressing – all the flavor without the mayo or egg! 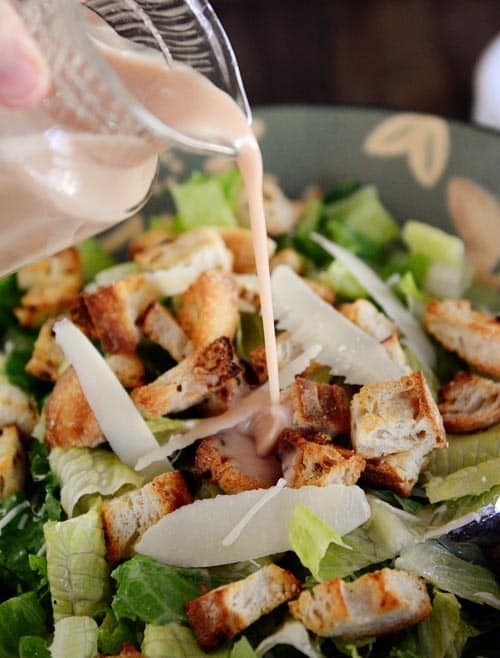 Thank you so much for a Caesar dressing recipe without anchovies! I have never been able to even get myself to try Caesar salad because of the thought of those little puréed fish in my salad. Definitely trying this! Thank you for being my continual go-to food website! I’ve been looking and waiting for a caesar salad dressing for a long time. Your recipes NEVER lead me astray! Thank you, thank you!! Homemade caesar salad is the best. Love this recipe! Looks like salad straight from a restaurant. Perfection. I’m suddenly craving salad. Have a wonderful weekend Mel!